A music video is something you need for your band and/or artist career, the below article includes tips on getting one done for free and an opportunity to actually get one for free. The best way to get a free music video is to find someone that is studying video production or animation at university and get involved in their projects. Lately I was at a bank for a loan. The office asked: Do you have securities? I said: I do have, and you? Silence - and I went off. Unlängst auf der Bank. Wegen einem Kredit. Der Kundenbetreuer fragt: Haben Sie Sicherheiten? Sag ich: Ich schon, und sie? Da hat er blöd geschaut und ich bin wieder gegangen. Harvey Glen is a professional Director of Photography (DOP) with over 10 years experience shooting commercials, documentaries, music videos, channel idents, corporate videos and drama. Harvey uses his DSLR camera to combine his passion for both stills and high definition (HD) video filming, a resource for DOP’s, cameramen, photographers and people who just love to get behind the lens and shoot. 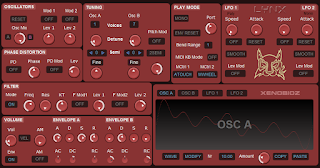 Xenobioz has announced Lynx, a subtractive synth VST instrument plugin for Windows with a powerful wave editor, drawable waveforms and two stacked unison oscillators. It is meant to have a limited set of features while still allowing for a lot of variety in its sound.